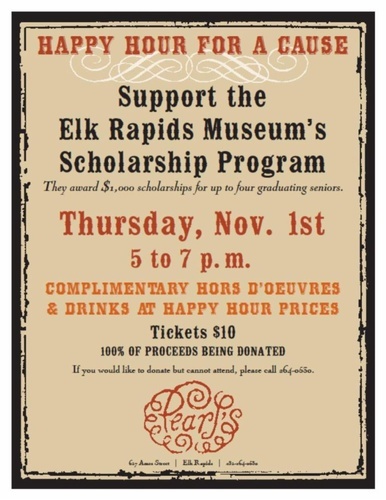 Pearl's Restaurant will be sponsoring a fundraiser on Thursday, November 1st for the Elk Rapids Area Historical Society, owners and operators of the Elk Rapids Area Historical Museum. This fundraiser is a community event to kick off our "Museum's Community Service Scholarship Program"
In cooperation with Elk Rapids Public Schools, the Elk Rapids Area Historical Society (ERAHS) has established a Community Service Scholarship Program. Each year, up to four high school students can receive a $1000 scholarship after successful completion of community service to the Elk Rapids History Museum over two summers. Students were trained this spring to conduct guided tours through the Museum on Wednesday and Saturday afternoons from Memorial Day through Labor Day. Attending or contributing to this fundraiser will start us off toward establishing a fund for these and future high school student scholarships.